Copan ruins is a small town very close from the impressive mayan temple of Copan, is located very close from El Salvador making it a great option of trip, we have shuttle buses service from the pacific costline and we also have package that include transportation from any hotel and transportation to the town of Copan, we have accommodation available, we suggest to do a two nights packages to enjoy this destination. - We have shuttle bus and private transporation direct to Copan Ruins town, the ride takes around 5 hours from the coastline and also from San Salvador city. - 3rd day ride back to El Salvador. Copán Ruinas is a municipality in the Honduran department of Copán. The town, located close to the Guatemalan border, is a major gateway for tourists traveling to the Pre-Columbian ruins of Copán. The Copán ruins house a UN World Heritage site and are renowned for the hieroglyphic staircase, stellae, and museum. The town of Copán Ruinas, often simply called Copán, is a beautiful place paved with cobblestones and lined with white adobe buildings with red-tiled roofs. There's even a lovely colonial church on the recently remodeled plaza. The Maya have inhabited this valley, which has an aura of timeless harmony, for about 2000 years. Copán has become a primary tourist destination, but this hasn't disrupted the town's integrity to the extent one might fear. The Copan Archaeological Park is just 1 km west of the city of Copan Ruinas, awaits amidst in a quiet forest along the Rio Copan. To get to the ruins take a nice walk beside trees that provide shade or you can rent a horse or order a taxi to take you directly to the site. The archaeological park is open daily from 08:00am until 04:00 pm. The entrance to visit is $ 15.00 for foreigners. The long historical research and excavation at Copan has left an extensive network of tunnels dug under the archaeological site. These tunnels, which used to be closed to public, have opened a window to the past baring tombs and temples that are not in plain sight. 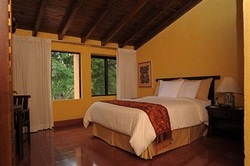 Our hotel partner in Copan ruins offer the most exclusive enviroment and confort, rooms totally equipped with private bathroom, cable tv, walking distance to the national park. We also have hostels and low budget hotels available, feel free to contact one of our agent or travel adviser to help you plan a great experience in this destination. - Shuttle bus transportation to Copan Ruins from the coastline of La Libertad in El Salvador.